Peru has its salsa de rocoto, aji criollo, and salsa verde de cilantro. Have you had Argentinian chimichurri? Chilean pebre? Guasacaca salsa de Venezuela? Have I convinced you? I often rely on homemade salsas to take the simplest dish from plain to fabulous. And they’re almost always quick, easy, and require only a few ingredients. At the end of the day, those leftovers will keep in the refrigerator for a quick snack or elevate your breakfast eggs the next morning. As a child, my Dad was a PhD student, and we were dirt poor. We didn’t waste anything, so come October, we roasted the pumpkin seeds after we carved our jack o’lanterns. I didn’t know them as “pepitas,” but I did love them. Fast forward about 30 years… while we still roasted pumpkin seeds for nostalgia sake, I discovered pepitas in the Latin section of our grocery store in Las Cruces, New Mexico! They came raw, roasted, salted or unsalted, and in or out of their shells. I quickly began incorporating them into my salads, and they found their way into my southwest salad. Pretty soon they ended up as a tasty garnish on dishes like Mexican Pumpkin Stew with Pork and Hominy and Low Carb Mexican Cauliflower Rice Bowls. I even incorporated them into a cilantro pesto in Red Chile Mussels with Cilantro Pesto. Why the interest in this somewhat humble ingredient? They’re healthy. A one ounce serving of pepitas (without the shell) has only 151 calories, mainly from protein and fat. That’s fewer calories and carbs than almonds, and more protein. Pepitas are rich in antioxidants, manganese, magnesium, iron, and zinc. In short, they’re just good for you! 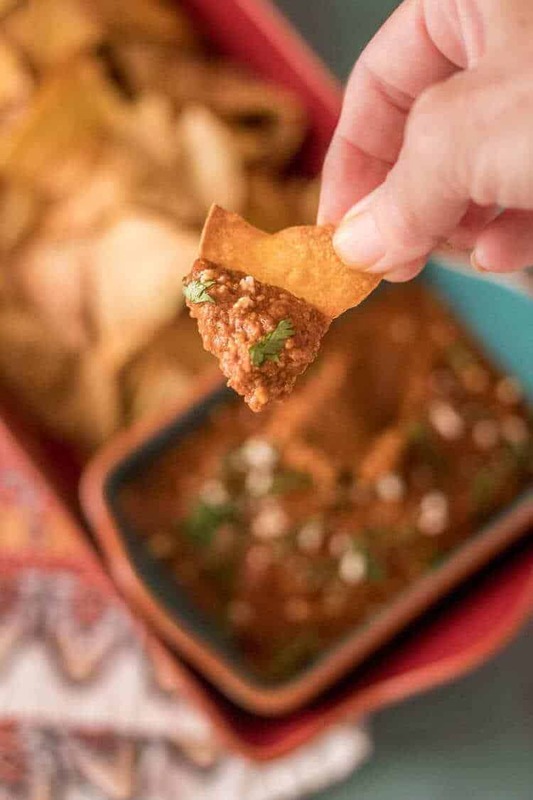 This salsa is not about heat, although you could bump it up if you’re so inclined. In developing this recipe, I sought to balance the earthy flavor of the pepitas with the fruitiness of tomatoes and the heat of red chile. Roasting the tomatoes and garlic intensifies their flavor. First step is to preheat your oven. Quarter the tomatoes, and cut the tip of the garlic off to expose the cloves. The garlic only needs 20-25 minutes, so set a timer. Burnt garlic is no bueno. 😬 The tomatoes require 45 minutes (give or take a few). While the tomatoes roast, you will toast the raw shelled pepitas in a dry skillet. 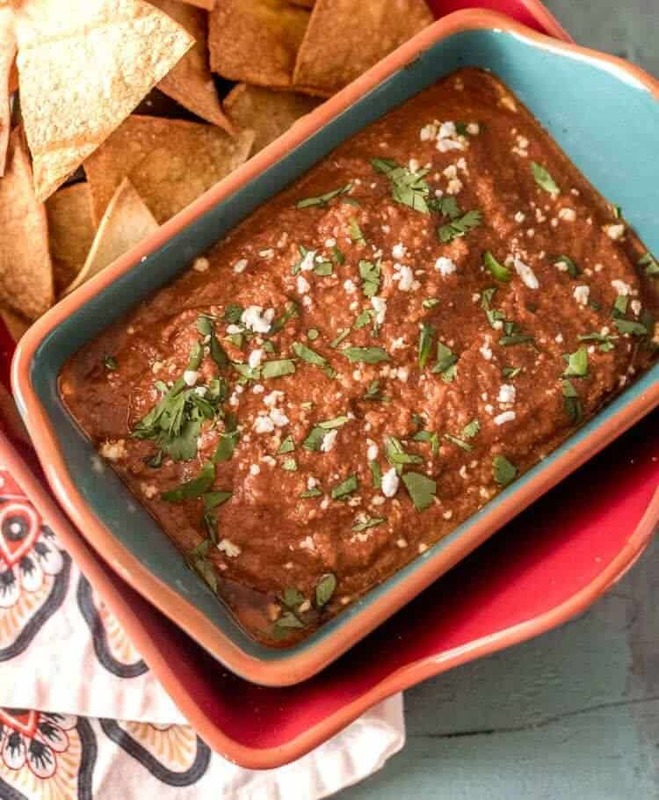 The red chile component can be as simple (or as complicated) as you wish to make it. On photo day, I made a purée of dried guajillo and ancho chiles that I had in my pantry. Normally, I would just use a commercial red chile sauce in a jar like this Guajillo Sauce or this NM Red Chile Sauce. If you opt to make the purée, this basic recipe works well. Keep in mind you can switch up the chiles. Dried red NM chiles work great! Heat the oil in a sauté pan over medium-high heat. Add the red chile purée and cook 2-3 minutes while stirring. Pour in the pepita-tomato mixture. Continue to cook an additional 2-3 minutes, adding additional broth to achieve desired salsa consistency. Season to taste with sea salt and pepper. 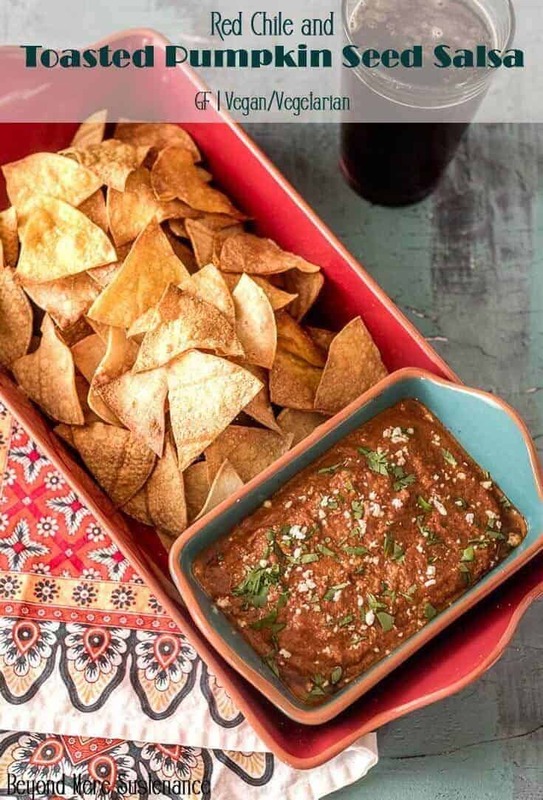 You won’t want to limit this tasty salsa to just chips. It’s a great dip for crudité (fancy term for veggie tray). As an accompaniment to grilled meats, it is fabulous. Within the next few weeks, I will feature Red Chile and Toasted Pumpkin Seed Salsa as part of the braising liquid in a Latin braised turkey thighs recipe. 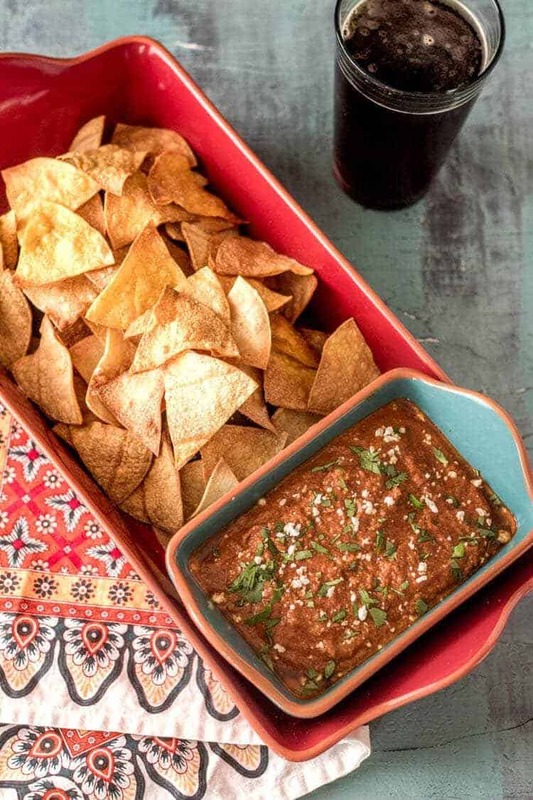 I hope you’ll give this salsa a whirl! 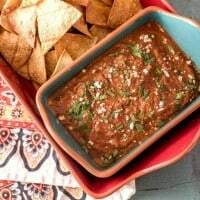 An earthy, flavorful salsa made with toasted pepitas (pumpkin seeds), red chile sauce, and tomatoes... A tasty new salsa to enjoy with chips or alongside grilled veggies or meats! 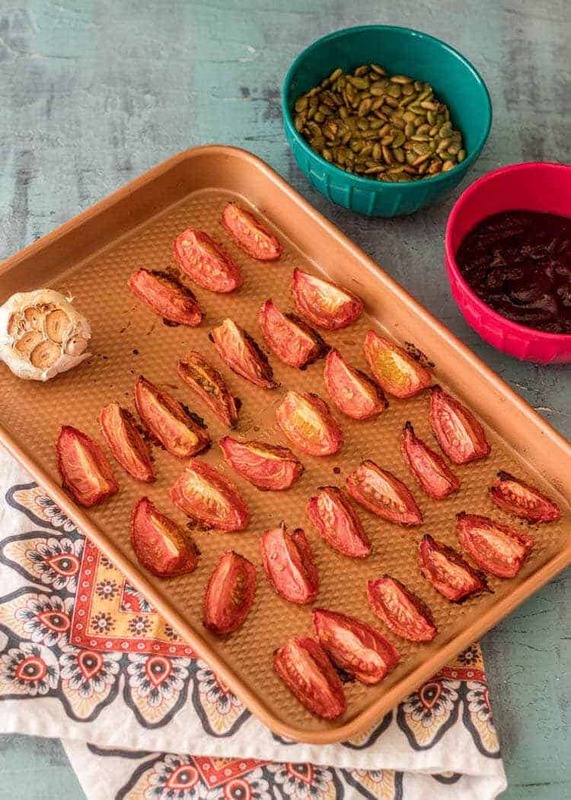 Arrange tomatoes and garlic on a baking sheet. Roast until the edges begin to brown. Garlic will be ready at 20-25 minutes (set a timer). The tomatoes will need 35-45 minutes. While the tomatoes and garlic roast, toast the pepitas in a medium-hot dry pan. Watch them carefully as you don't want them to scorch. The seeds should have a good amount of brown on them. Add the prepared pepitas to the bowl of your food processor. Pulse until finely ground. Add the tomatoes, garlic cloves (squeezed from their skins, and broth (start with about 1 cup). Heat the oil in a skillet over medium to medium-high heat. Stir in the red chile sauce, and cook 2-3 minutes (stirring continuously). Add in the pepita-tomato mixture. Continue to stir an additional 2-3 minutes. Garnish with cilantro, crumbled cotija (not vegan), scallions as desired. Serve with chips, crackers, or veggies. As I mention in the post, you can purchase red chile sauce (New Mexico red, guajillo, ancho, etc.) or you can make your own by rehydrating dry red chiles and processing them until smooth. Calories are an approximation from MyFitnessPal.com, and are based on 2 tablespoons. Pepitas add such a unique flavor and texture to Latino comidas, I just love using them! Have never used them in a salsa and look forward to giving this a try. They're a great snack, and a wonderful garnish MJ! I have focused my blog on Latin America, and started looking at more ways to use them. I actually love pepita butter on toast! That's what prompted including them in sauces (a bit like tahini)! Haha! I remember you couldn't stop eating them... We'll have them again soon.